The causes of poverty vary drastically. Through a holistic approach, we work daily to combat cycles of poverty. Poverty has many faces and factors. These factors include economic conditions like short and long-term unemployment, lack of affordable housing, mental illness, food deserts, addiction, educational voids, financial literacy, various forms of abuse, and more. These interconnected issues continue year-after-year and generation-after-generation - until The Salvation Army enters in. We meet people where they are in life. Through programs that serve the body, mind, and soul, we combat the factors of poverty and help people build a pathway to where they want to be. This holistic approach helps create sustainable change in millions of lives, every single day. 46.7 million people in America live below the poverty line. 60 million more are one crisis away from needing help. Unfortunately, poverty hits children the hardest, drastically limiting their opportunities to learn and achieve at the same level as their peers. The Salvation Army helps to level the playing field for all. Pathway of Hope is a holistic Salvation Army approach to create a path out of poverty. We provide targeted services to families with children under the age of 18, both traditional and non-traditional family structures, that desire to break the cycle of crisis. Through case management, we focus on a family's capabilities and raise hope by empowering them to overcome barriers on the path to self-sufficiency. Families set their own goals, and we partner with them to provide the resources needed to accomplish each one. This program is available at every Salvation Army Worship and Service Center in the Midwest. When life throws a curveball, you can still count on a warm bed to sleep in. If you've lost your home and need immediate help, you can stay at one of our facilities until you get back on your feet. In cities where we don't have facilities, we refer you to partner programs or, when possible, provide financial assistance to cover nightly housing costs. We also provide rent and utility assistance to to keep individuals and families from becoming homeless in the first place. In the U.S., The Salvation Army provides 10 million nights of housing per year. No one should ever have to make the difficult choice between eating a meal or paying a bill, but this is a reality for millions. While the task may seem daunting, The Salvation Army answers the call by serving over 55 million warm, nutritious meals annually. As rental prices rise, people are forced to pay more than they reasonably should, causing many to live paycheck-to-paycheck. Across the Midwest and America, most new developments are high-end, making modestly-priced units and affordable housing increasingly rare. 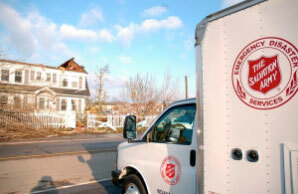 The Salvation Army is here to help people stay in their homes when they have nowhere else to turn. Our emergency rent and utility bill assistance programs throughout the Midwest keep the lights on and give peace of mind. We provide confidential, professional assistance to individuals looking for temporary and permanent employment through our community centers and partner organizations in the Midwest. Our goal is their goal - identifying skillsets, providing a supportive environment, and securing job leads. Clothing and household items can be a drain on an already tight budget. Our Salvation Army Stores sell these items at a reduced cost. In most locations, we can supply store vouchers to single adults, families or disaster survivors experiencing financial strain. To request a store voucher, schedule an appointment at your local Worship and Service Center. An unexpected car accident, a costly repair, or not having enough money to put gas in the tank in order to get to work are real issues. The scenarios vary, but one constant is that The Salvation Army is there to help. We can provide bus cards and gas money. To request transportation assistance, schedule an appointment at your local Worship and Service Center. Nothing is more stressful during a medical emergency than the piling up of unpaid bills. Check with your local Worship and Service Center to see if funding is currently available for medical assistance. We may be able to help with insurance co-pays and prescription costs. We understand the winter months may be especially difficult as needs arise and finances are stretched. When growing kids require new snow boots, gloves, hats and coats, many Salvation Army locations have coats available for kids. Not to mention Christmas, which can be more stressful than joyful when the budget is tight. We may have a holiday program in your area to meet your family's needs. Cycles of poverty can end. You can help. Poverty impacts the most vulnerable. 21% (15.5 million) of children under age 18 live in poverty. 10% (4.6 million) of seniors over age 65 live in poverty. 29% (4 million) of those living with a disability live in poverty. 6% (1.2 million) of veterans live in poverty. A donation to The Salvation Army provides safe, free shelter to someone living on the streets. Donate now. Childhood poverty is a crisis. Among the 35 wealthiest countries in the world, the United States has the 2nd-highest child poverty rate â one out of every five children lives below the poverty line. A donation to The Salvation Army feeds children in your community.Donate now. Poverty has a hefty price tag. 14.8% of Americans â and 21% of the nation's children - currently live in poverty. A donation to The Salvation Army helps keep families together and off the street. Donate now.